911261 - Quarter Master Ultra-Duty Quick Change Gears - MiataRoadster - Stay tuned with MiataRoadster! Over sixty years of gear manufacturing know-how went into designing Quarter Master Ultra-Duty Quick Change Gears. Starting with the highest quality E9310 aircraft steel, we precision hob them to AGMA Class B Tolerances to produce a true involute tooth form for a high contact ratio. After a proprietary heat treatment process, all gears are hand roll tested and inspected. 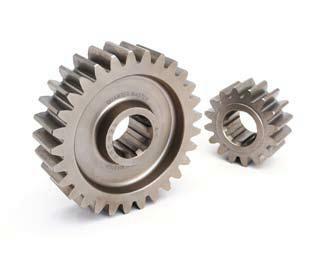 These quick change gears are specifically designed to run smoother and last longer than any other on the market. They are available with 64 gear ratios in 10-Spline for Sprint and Late Models, and 42 gear ratios in 6-Spline for Midgets.